Most Chicago colleges and universities joined high schools across the nation in staging walkouts on Wednesday, protesting gun laws and violence in the wake of the Parkland shooting. Students from Northwestern University, Truman College, Malcolm X College, Roosevelt University, Columbia College and the University of Illinois at Chicago participated to varying degrees. Some demonstrations only took place in the morning at 10 a.m., but others had broader scopes. 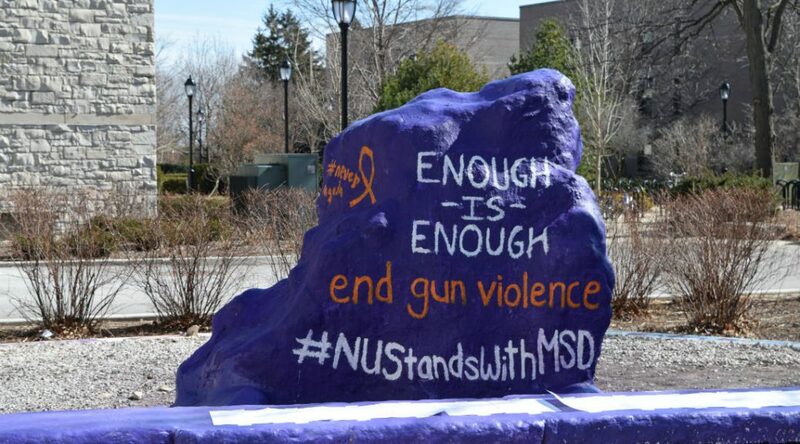 Northwestern hosted a daylong menu of events, starting at 10 a.m. Students held a walkout and moment of silence, along with a letter-writing campaign aimed at politicians. But come afternoon, a hoax caused chaos on campus. At 2:39 p.m., Northwestern’s campus went on lockdown as students received emergency alerts about an active shooter at Englehart Hall, a grad-student apartment dorm on Emerson Street and Maple Avenue. Students barricaded themselves in classrooms and storage closets until the university gave students outside that immediate area the all-clear at 3:52. As it turned out, there was no shooter after all; police labeled it a hoax. Danny Cooper, a junior from New York, planned NU’s events with classmates. Cooper and his fellow organizers weren’t working on behalf of a student organization, but were driven by their passionate support for tighter gun-control laws. “I think people had been waiting for this opportunity to voice their frustration with the policies and politicians who are not standing up and not preventing things like Marjory Stoneman Douglas from happening,” Cooper said. A 6 p.m. candlelit vigil was postponed due to the active-shooter alert, and Cooper said organizers hope to reschedule for another day within the next week-and-a-half. “It was such a crazy day, I don’t know if anyone really wants to be in that sort of space right now,” he said. Cooper estimated 200-225 students attended the morning walkout, a number he was pleased with, considering final exams start on Monday. Truman also staged a walkout, while a crowd gathered on Michigan Avenue for demonstrations outside Roosevelt University and Columbia College. Malcolm X College held a walkout and demonstration involving 30-40 people, according to Matthew Mccuan, a student pursuing his GED who participated. Although many recent shootings have occurred at high schools, older students said they still feel affected. “It can happen anywhere, so I think it was great that everyone was participating” Mccuan said.